Finding court cases can be extremely difficult if you do not have a basic understanding of the U.S. Court System and its structure. 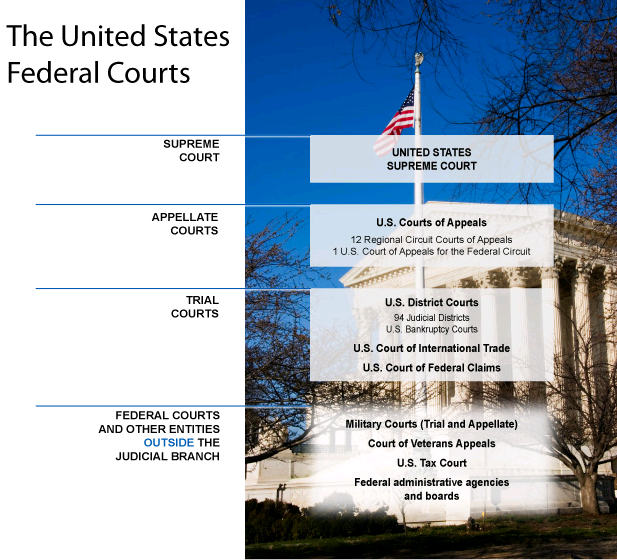 This section provides basic information about the structure of U.S. Federal and State Courts. The country is divided into 94 federal judicial districts. Each judicial district has a U.S. district, or federal trial court. The trial courts are where federal cases are tried, witnesses testify, and juries serve. Each of the 94 districts lie in one of 12 regional circuits. Each circuit has a court of appeals. If you lose a case in a district court, you can ask the court of appeals to review the case. The 5th Circuit Court of Appeals, which covers Louisiana, Mississippi, and Texas, is located in New Orleans at 600 S. Maestri Place in the French Quarter. The Supreme Court of the United States, in Washington, D.C., is the highest court in the nation. If you lose a case in the court of appeals (or, sometimes, in a state supreme court), you can ask the Supreme Court to hear your appeal. The Supreme Court hears only a very small percentage of the cases it is asked to review. The Judicial Branch in the State of Louisiana consists of a Supreme Court, 5 Circuit Courts of Appeal, 40 District Courts, and other courts including family courts, parish courts, and justice of the peace courts.